CHIBA CITY, JAPAN, June 8, 2018 - (Media OutReach) - DHL Global Forwarding, the leading international provider of air, sea and road freight services, has successfully taken the Red Bull Air Race World Championship to the skies at its Japan stop. As the official logistics partner of the Championship, DHL Global Forwarding delivered around 420 tons of cargo via both air and sea to the Makuhari and Urayasu areas of the Chiba prefecture - both major event hubs supporting the race's third stage - ranging from highly fragile aircraft components to sections of the physical race-track itself. Using two Boeing 747-400 freighters as well as land and sea transportation, the multi-modal solution covers a total length of 70,000 kilometers and 3,500 tons for the entire season. DHL Global Forwarding supports the event with transportation, setting up and dismantling of race infrastructure at each stage of the worldwide race - a process that it completed within less than a week for the Chiba stage. "We are delighted to be partnering with Red Bull Air Race World Championship again this year," said Charles Kaufmann, President/Representative Director - DHL Global Forwarding Japan K.K, CEO, North Asia, Head of Value Added Services - Asia Pacific, DHL Global Forwarding. "Our goal remains the same: to ensure our solution provides flexibility and cost-effectiveness in a championship environment with sky-high standards for timeliness and care. That is why we take extreme precautions to ensure that all materials arrive safely and securely, in compliance with international shipping requirements and national import laws." Items transported include race planes, wings, tails, spare parts, as well as broadcasting equipment and event infrastructure like route pylons, boats and equipment for the VIP Skylounge. The mode of transport varies depending on the schedule and the next race location, using DHL Global Forwarding's air freight capabilities (AFR) for the most time-sensitive cargos, supported by ocean freight (OFR) for heavier goods like hangars and race track operation materials. The entire multimodal solution is designed for highly precise, compliant handling of extremely fragile goods - essential to ensuring the safety of both pilots and racegoers at all of the Championship's eight locations. 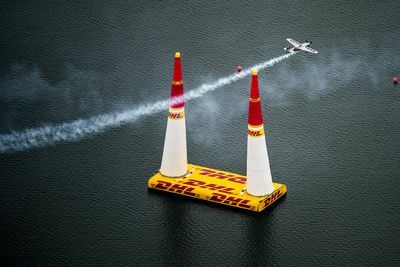 "Race planes may appear swift and agile in the air, but when they're on the ground, require the transportation expertise of a seasoned operator like DHL Global Forwarding," explained Clemens Jaeger, Director of Series, Red Bull Air Race. "For example, the way you strap an aircraft to the pallet to minimize movement during transit is crucial. If anything is damaged during the process, the race team may risk losing precious training time while repairs are carried out or even not participating on the race. "DHL Global Forwarding has demonstrated nothing but the utmost care in how they handle these sensitive cargos every year, without compromising the speed and efficiency needed to get everything to the starting line. We're grateful to the sheer professionalism with which they approach this massive undertaking: the speed, adaptability, and customs expertise of their services plays a key role in keeping the race aloft in every city we go to." This is the fourth year that Chiba City has hosted the Red Bull Air Race World Championship. The port city, located 40 kilometers east of Tokyo, attracts thousands of visitors each year who come to watch their favorite teams navigate a low-level slalom track marked by 25-meter-high, air-filled pylons. After Chiba, the championship will head to its next destination in Budapest, Hungary; before going on to Russia, Austria, and the United States. "The logistics for Red Bull Air Race is not only about safely handling delicate equipment, but also about efficiently moving them across the globe into some of the world's top destinations," added Kaufmann. "Our team of international logistics experts utilize the company's global network to map out the route, handle complex customs clearance process, and explore every detail of the venue and the surrounding area to understand the requirements and challenges long before the freight arrives. Challenging as it may be, it's an honor to support such an iconic race that also aligns with DHL's commitment to delivering speed, safety, and excellence all over the world."